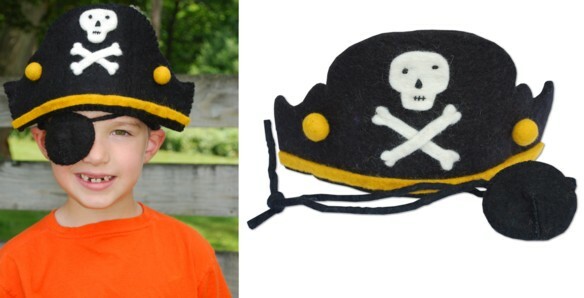 Our 2 piece pirate set includes 1 pirate hat and 1 eye patch. Set is hand felted in Nepal and are adjustable to fit most kids over the age of 3. Both hat and patch are lined for comfort. Handmade Nepali felt is some of the finest in the world. Using only soap and water, and employing ancient felting techniques, New Zealand wool is dyed, cut and sewn to create our heirloom quality toys. In a small family owned business, the workers, primarily women, are paid a fair wage and work in pleasant surroundings. No child labor is used. Laughter, chatter and pride are always present. 2 Big Kids inspects the factory several times during each production cycle to insure quality and verify FAIR TRADE policy. An heirloom toy, hand felted in Nepal. Spot clean with soap and cold water when needed.